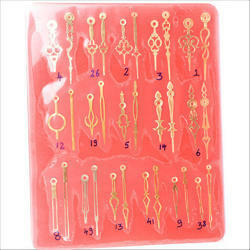 Wall Clock Needle is best in quality and reliable in nature. Moreover to this, it is scratch proof and presented to consumers in safe packing. We have quality wall clock/ table clock hands made using imported metals. Clock Hands are available in all Sizes, Shapes and design. Hour and Minute length is indicated in mm (millimetre) below each photograph / design. Dimensions are from the Centre Hole of every hands. Colors available regularly are Black, Golden & Silver. Other Colors will be made as per requirement. Model Nos. are indicated below each design.